I was blog hopping when I came across a post that I could completely relate to . . . pet peeves. We all have our irritations in life, right? Well, I found out that I’m not the only one who has pet peeves in virtual reality, A.K.A. the bloggy world. Jessica @ Mrs. Stanford’s Class is having a linky party to share pet peeves with regards to blogs. If you blog for any amount of time, your blog begins to feel like a personal extension of yourself. I realize giving constructive criticism can feel like someone criticizing your child. None of my pet peeves are directed at a specific blog. So, let me preface this with saying, these are just my opinions. I will try to give my opinions in a Randy Jackson way rather than like Simon Cowell. I don’t want to hurt any blogger’s feelings. Click to visit the linky party. This will show you all of the recent comments left on your blog. If you see one that is questionable, you can click to delete it. 2. Fonts, who doesn’t love them. I love them so much that I downloaded 893 of them and am always looking for more. 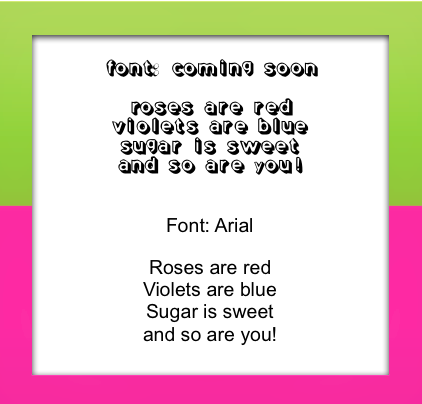 But, for some reason, I have a really difficult time reading the font called Coming Soon. I believe that a picture is worth a 1,000 words so, which of these fonts is easier for you to read? 3. I don’t know if this is a pet peeve as much as it is a “food for thought” for bloggers. When blogs take a long time to load, readers, myself included, hop over to another blog. Maybe it’s my limited attention span, but if I have enough time to eat a sandwich before your blog loads, then “Houston, we have a problem.” If I am clicking out without reading your blog, there are probably others who are doing the same thing. I read somewhere, that having too many pictures on your home page will cause this. One of the things I do to check for this problem, is to visit my blog from a different computer. Use your husband’s computer or visit your public library, but check your load time. It might increase your page views. I wish there was a Miss Manners of the blogging world who could address some of these issues. I am reading all the posts on this linky party to see if I am guilty of any of these offenses and will try to correct them. I am interested to hear what your pet peeves are. Leave me a comment below. Also, if there is something that you love to see or read on blogs, leave that, too. Maybe I can write some posts about your suggestions. Thanks! I totally agree with the robot and the fonts. Your example is perfect. It def. shows how some fonts are so difficult to read. I personally think my blog takes a lot of time to open. I wish that it didn't, but I am not for sure how to fix it. I'm going to add my two cents worth too… I hate verification codes too – they almost turn me off leaving a comment especially when they are so unbelievably difficult to read!! I agree with all of your "peeves" 🙂 Just found your blog through the linky party and am your newest follower. P.S. I would love you to join my new linky party about music in the classroom. Hello Michelle, It is January 2015, and I am a little late to post a comment to this discussion. Your site was recommended as a reference for "Pet Peeves" by my "Gale" online class instructor. Her class is Blogging and Podcasting for Beginners. I am glad she suggested your link. I have been reading blogs for about a year and find that some features, like the ones you mentioned(I agree with all), are annoying and reflect negatively on the site. I would like to add one of my own. Bloggers that take half a page of typed discussion to get to their point. By then I have lost interest. Thank You Michelle for your blog on Pet Peeves and for your recommendations, which as a new blogger are very appreciated. I received yur paper last nite! it was sooo good I passed it along to the instructor for posting. I will be back in contact later tonite with more updates. Just my two cents.. you will never be promoted EVER if you write like this in the business world.